This version of Kha Moo (ขาหมู) is a delicious and flavorful pork leg roast that is braised and then simmered for 3 - 4 hours in a broth made with star anise, cinnamon, cumin, sugar, soy sauces, and Shitaki mushrooms. 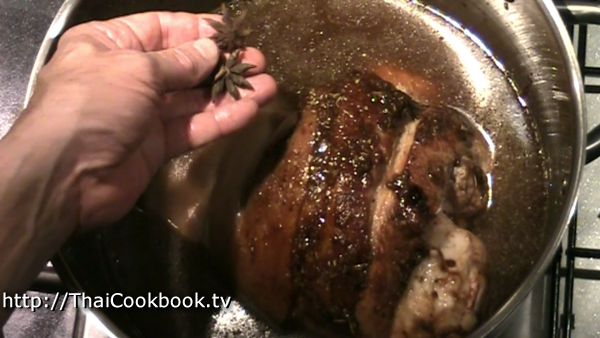 The result is a rich and juicy pork roast unlike many others. Traditionally, it is served as a one-dish meal over steamed rice (Khao Kha Moo), with a spicy garlic dipping sauce, fresh bird's eye chillies and cloves of garlic. You will usually get it with boiled egg and either blanched Chinese broccoli or pickled mustard greens. While normally eaten in this plate lunch style, this pork is good enough to be served as the main course at a family style dinner. What's in our Braised Pork Leg. 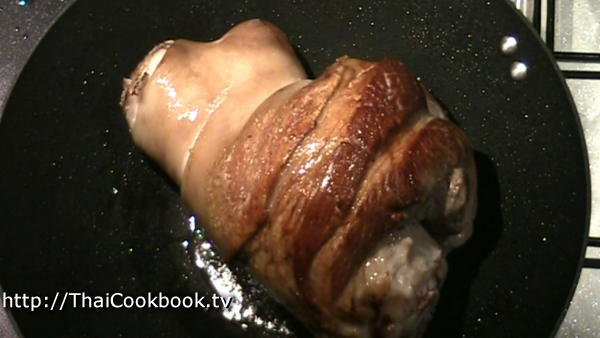 How we make our Braised Pork Leg. 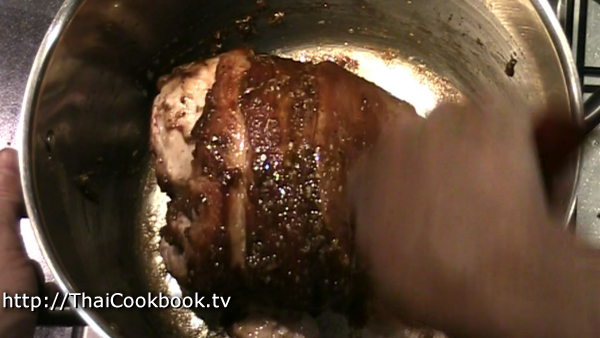 1) Coat the pork leg in oil, then brown it in a frying pan on all sides. 2) Prepare the herb paste by grinding the garlic, coriander root, peppercorns, and salt together. 3) Fry the paste and coconut sugar in oil for about 1 minute until fully melted together, then add the pork, coating it in the herbs. Fry on all sides until well browned and caramelized. 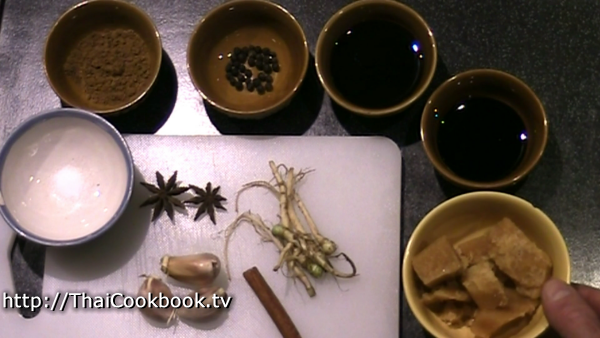 4) Add water, light and dark soy sauces, star anise and cinnamon. Cover and simmer slowly for 2 - 3 hours. Add mushrooms and boiled eggs to pot during last hour. Rub a generous coat of vegetable oil over the entire pork leg roast. Brown the roast in a large wok or frying pan using 1/4 cup of vegetable oil. Turn it over and around to fully brown it everywhere, as much as possible. Measure and arrange the ingredients used in cooking the meat. They are 1/2 cup coconut sugar, 2 Tablespoons Light Soy Sauce, 1 Tablespoon Dark Sweet Soy Sauce, 2 teaspoons Five Spice Powder, 2 Star anise seeds, 1 cinnamon stick, 3 Large Cloves Garlic, 4 Coriander Roots, 1/2 teaspoon black peppercorns, and 1/4 teaspoon salt. Using a mortar and pestle, grind the garlic, coriander root, peppercorns, and salt together until you get a fine paste. 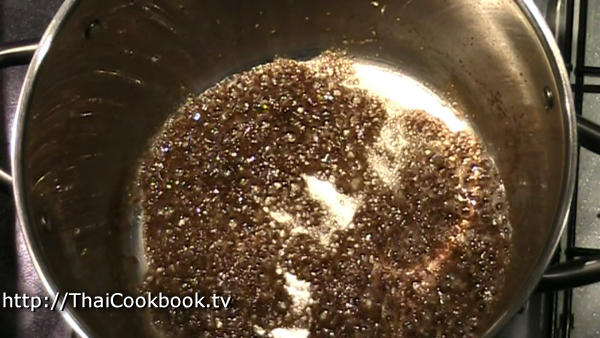 Add 2 Tablespoons vegetable oil to the bottom of your soup pot over low heat. Add the herb paste you made in the previous step and fry it gently in the oil for about 1 minute. Add the coconut sugar and about 2 Tablespoons of water. Stir it all up and melt the sugar until it dissolves completely. Keep the heat low so it doesn't burn. Add the Chinese 5 spice powder and stir it into the sugar and herb mixture until it is smooth. Add the pork leg to the pot and fry in the sugar, herbs and spices on all sides until well caramelized. Add enough water to the pot so the roast is covered about half way. Stir in the light and dark soy sauces. Drop in the star anise and cinnamon. Cover and turn up the heat until you get a hard boil, then reduce the heat until it is barely bubbling. Simmer for 2 hours, checking often and adding more water as needed. While the meat is cooking, you have time to get some of the optional sides ready. Some people like to nibble on the extremely spicy small Thai chili or fresh garlic. 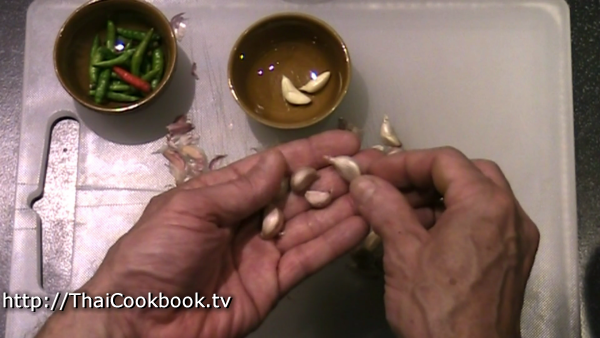 Wash the chilies and remove the stems, and clean up the outer shells from the garlic. If you are serving the meal soon, then go ahead and peel everything off the garlic too. Put them each in a small bowl for the table. Next, make the strong garlic sauce if you plan to serve it. 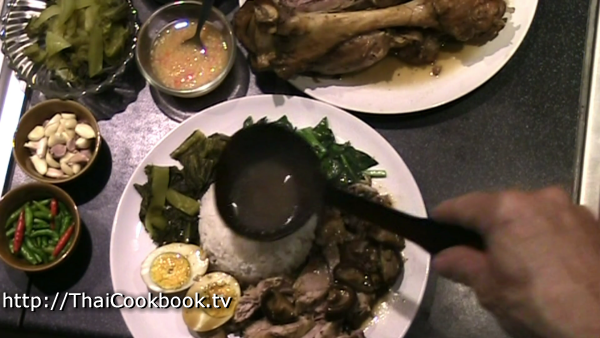 The sauce is an excellent counter flavor to the sweet broth, so most people like it. You'll use 3 Tablespoons of finely chopped garlic, 2 finely chopped coriander roots, 2 finely chopped Thai Hot Chilies, and 2 Tablespoons distilled white vinegar. 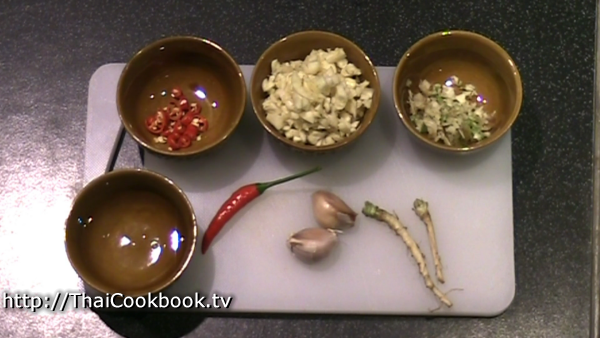 Use a mortar and pestle to pound the garlic, coriander root, and chilies into a rough paste. Just stir the vinegar and fresh ingredients together in a small bowl and let it marinate until time for dinner. Serve at the table as an optional condiment. Store the unused portion in the refrigerator, in a container with a lid. It will keep for a long time. If you plan to serve the sour pickled Chinese mustard, then open the package and drain the liquid. Rinse the stalks of mustard under running water, drip dry, then slice into 1/2 inch pieces. Put them in a small bowl to serve at the table as an optional condiment. After cooking the meat for about 2 hours, it's time to get the last ingredients ready. Peel the shells off the hard-boiled eggs. 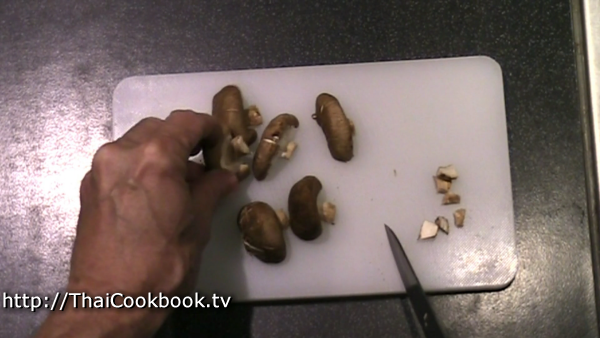 Wash and cut the mushrooms in half. Add the boiled eggs to the pot with the meat. Add the mushrooms and stir everything up well. Check the water level, cover and cook for one more hour. 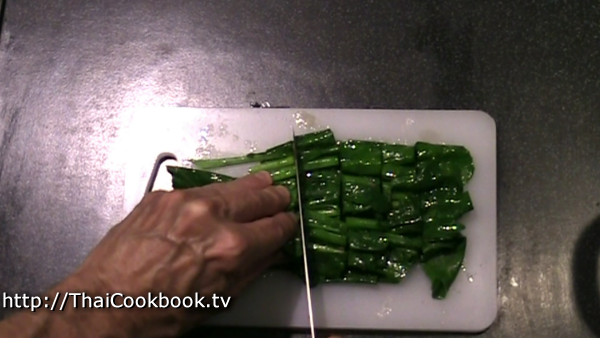 While you're waiting, cut the Chinese broccoli into 3 - 4 inch pieces. After the meat is cooked, for a total of at least 3 hours, remove it from the pot and let it cool on a platter. If serving a dinner, then you'll carve the meat for each plate at the table. 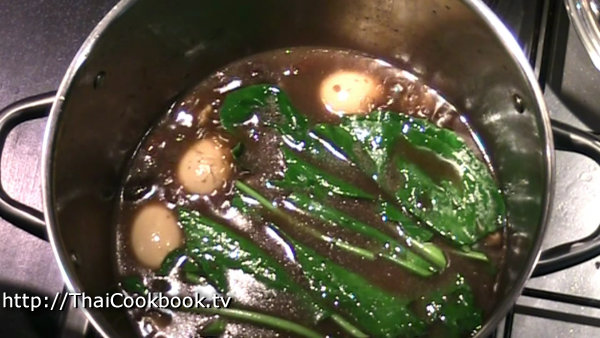 Continue simmering the broth with the eggs and mushrooms until you are ready to serve dinner. Shortly before serving, add the Chinese broccoli to the broth and blanch it for about 15 seconds. It should be just barely cooked, but still crunchy. Remove it, drain the liquid, and place it on a cutting board. Also remove the eggs and let them cool, then cut them lengthwise in half and put them on a plate to serve at the table. Ladle some broth and mushrooms into a bowl for serving. 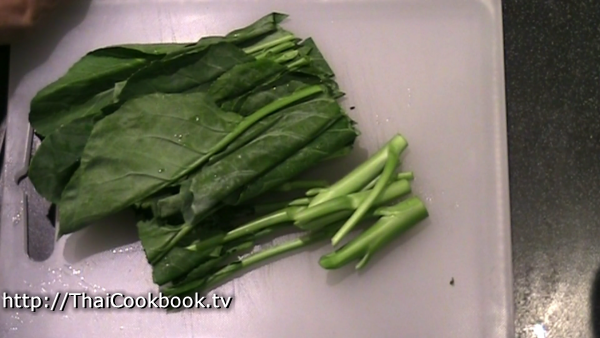 Cut the Chinese broccoli into 1/2 inch pieces and put it in a bowl for serving. 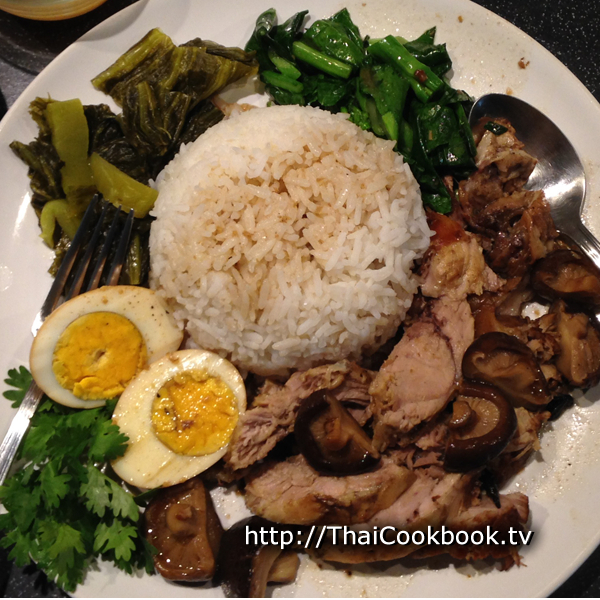 Khao Kha Moo is most often served as a one-dish meal, and what you usually get is a scoop of hot rice and just a very small amount of meat, fat and skin, with a small portion of mustard or Chinese broccoli. I like to make this into a meal that is suitable for a sit-down style dinner, so I serve everything all at once. Carve the meat at the table, have all the sides available, and of course plenty of hot rice and gravy.